Our next “C” in our assessment of the Four C’s of Diamonds is an exploration diamond color. Color is often seen as the second most important “C” after cut. When specialists discuss color, they are actually discussing the lack of color or “whiteness” of the diamond. The reason for this is because most diamonds naturally have a yellow tint in them, and diamonds with a minimal or no yellow tint are pretty rare. Thus, diamonds without yellow in them (aka colorless diamonds) are widely sought after and deemed the best, clearest diamonds. 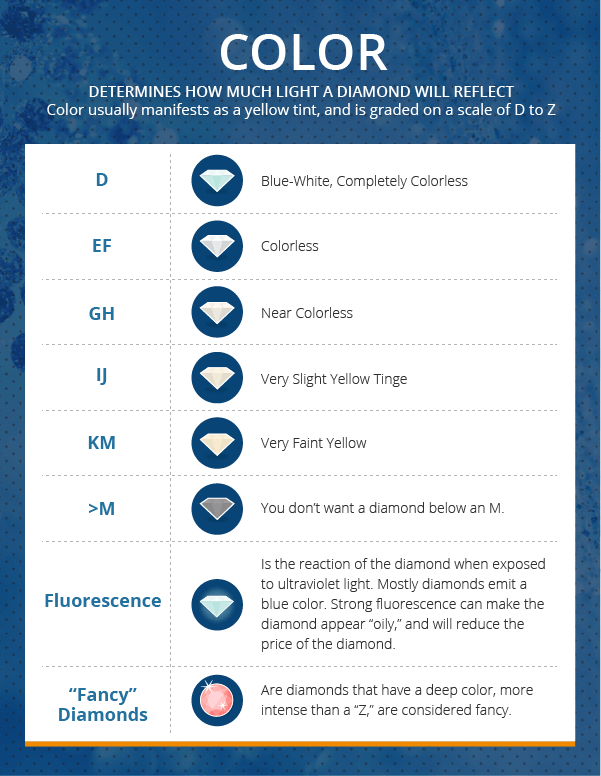 The Gemological Institute of America has a color scale to determine the color grade of a diamond. Their scale ranges from D-Z, with D being the highest and Z the lowest. D grade diamonds are the best white diamonds with no detected yellow tint, and Z grade are the lowest color grade diamonds with extreme yellowy hues. Colorless – (D, E, F) It is very hard for anyone, even gemologists, to tell the difference between a D, E, and F colored diamond. Near Colorless – (G, H, I, J) These diamonds also are considered to have an excellent color and are a very slim notch down from colorless. Faint Color – (K, L, M) Unlike colorless and near colorless diamond, faint color diamonds have yellowy colors that are visible to the naked eye. You don’t want a diamond below an M.
Very Light Color – (N-R) Diamonds with this grade have an obvious yellow or brownish tint. Light Color – (S-Z) These diamonds are typically too yellow for customers looking to buy white diamonds. It is absolutely vital to know what color your setting should be in order to maximize the color of your diamond. You never want to use yellow gold with a colorless diamond because the diamond will reflect the yellowy hue of the metal, making you expensive F color diamond look like a cheaper K color. Conversely, you also would not want to set a yellow tinted faint color diamond in platinum or white gold because the silver metal makes the yellow look more yellow. Setting a yellower K color diamond in yellow gold will make it look more like a J color. White Gold/ Platinum – The optimal setting for any diamond with a color grade of J and above. Yellow Gold – The optimal setting for any diamond with a color grade of K and below. Color Becomes More Important As Carat Weight Increases – Choose G-H diamonds when purchasing diamonds that are 1-carat and over. 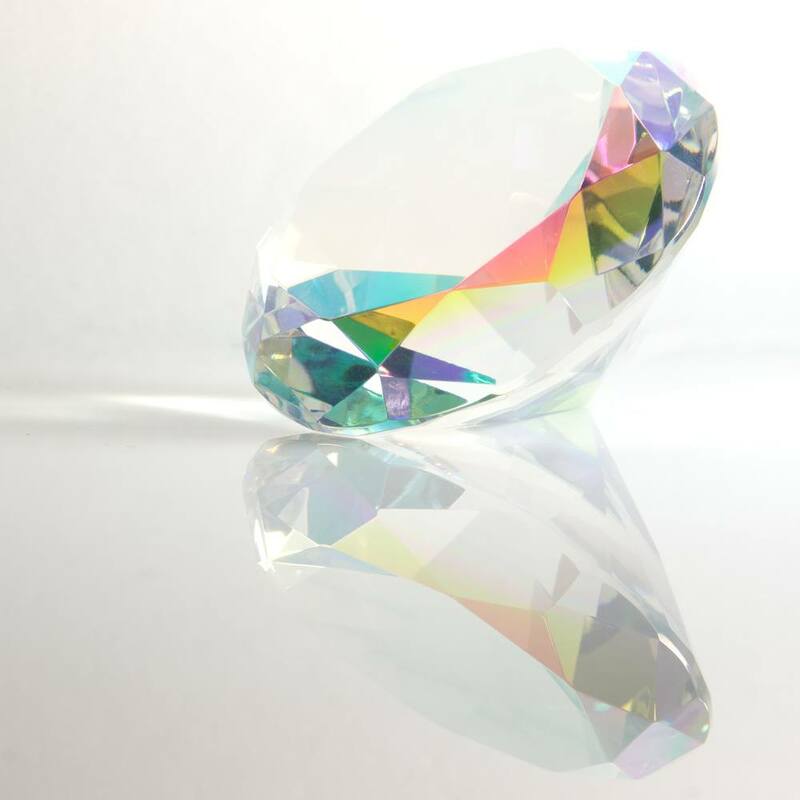 It is easier to see the color in larger diamonds. What GIA Color Certification Looks Like – While shopping, look for diamonds with exact color grades (G color or H color). If you see that a diamond’s color is shown as a range (J-H), then it is not GIA graded. You can shop for diamonds by color today using Brilliance.com’s helpful search filter. It is worthwhile to try and find diamonds with a higher color grade, because it will only help your diamond appear that much more vibrant and alluring.